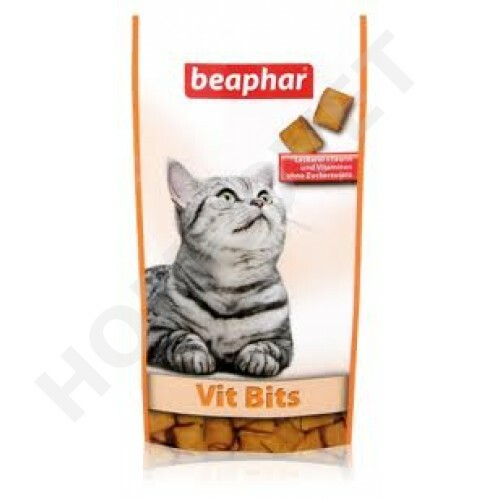 Vit-Bits for cats are crunchy treats filled with delicious multi-vitamin paste. The perfect snack in any situation, with added taurine which is essential for good eyesight. A well-balanced combination of extra Bvitamins which prevent nutrition-caused deficiency symptoms such as: loss of hair, skin problems and dull coats. Grain, vegetable. By-products, meat and animal. By-products, minerals, oils + fats. Crude protein 31.6%, fat 8.4%, fiber 2.8%, ash 3.8%, moisture 8.5%, Phosphorus 0.52%, calcium 00.6%, Sodium 0.12%, Potassium 0.68%, Magnesium 0.13%.